Nicotiana benthamiana is a close relative of tobacco and species of Nicotiana indigenous to Australia. The herbaceous plant is found amongst rocks on hills and cliffs throughout the northern regions of Australia. Variable in height and habit, the species may be erect and up to 1.5 metres (59.1 in) or sprawling out no taller than 200 millimetres (7.9 in). The flowers are white. The plant was used by people of Australia as a stimulant - it contains nicotine and other alkaloids - before the introduction of commercial tobacco (N.tabacum and N.rustica). The indigenous names for it include tjuntiwari and muntju. It was first collected on the north coast of Australia by Benjamin Bynoe on a voyage of HMS Beagle in 1837. A synonym for this species is Nicotiana suaveolens var. cordifolia, a description given by George Bentham in Flora Australiensis in 1868. This was transferred to Nicotiana benthamiana by Karel Domin in Bibliotheca Botanica (1929), retaining the author's name in the specific epithet. Nicotiana benthamiana is considered by a growing scientific community as a model organism for performing plant research. 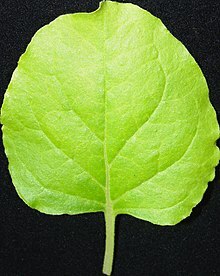 For example, the leaves are rather frail and can be injured in experiments to study ethylene synthesis. Ethylene is a plant hormone which is secreted, among other situations, after injuries. Using gas chromatography, the quantity of ethylene they emitted can also easily be measured. Due to the large number of plant pathogens able to infect it, N. benthamiana is widely used in the field of plant virology. It is also an excellent target plant for agroinfiltration and a platform for industrial production of recombinant pharmaceutical proteins, including monoclonal antibodies. Nicotiana benthamiana has a number of wild strains across Australia, and the laboratory strain is an extremophile originating from a population that has retained a loss-of-function mutation in Rdr1 (RNA-dependent RNA polymerase 1), rendering it hypersusceptible to viruses. Nicotiana benthamiana is also a common plant used for pharming; for example, the drug ZMapp was produced using these plants. ^ a b Patton J (9 August 2014). "How Owensboro tobacco grew a possible miracle drug to treat Ebola". Lexington Herald-Leader. ^ Van der Hoorn RA, Laurent F, Roth R, De Wit PJ (April 2000). "Agroinfiltration is a versatile tool that facilitates comparative analyses of Avr9/Cf-9-induced and Avr4/Cf-4-induced necrosis". Molecular Plant-Microbe Interactions. 13 (4): 439–46. doi:10.1094/MPMI.2000.13.4.439. PMID 10755307. ^ Bally J, Nakasugi K, Jia F, Jung H, Ho SY, Wong M, Paul CM, Naim F, Wood CC, Crowhurst RN, Hellens RP, Dale JL, Waterhouse PM (November 2015). "The extremophile Nicotiana benthamiana has traded viral defence for early vigour". Nature Plants. 1 (15165): 15165. doi:10.1038/nplants.2015.165. PMID 27251536. "Nicotiana benthamiana". FloraBase. Western Australian Government Department of Parks and Wildlife. "Nicotiana benthamiana". Australian Plant Name Index (APNI), IBIS database. Centre for Plant Biodiversity Research, Australian Government. This Solanales article is a stub. You can help Wikipedia by expanding it. This page was last edited on 5 March 2019, at 18:49 (UTC).